After four hectic days at work, I took a little break and gave myself the time I wanted. Today, I went to Megatrade Hall first thing in the morning. 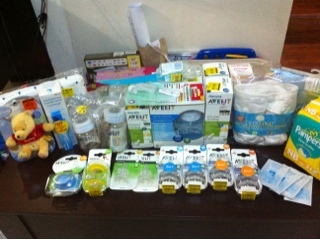 I was set to get hold of the best buy baby bottles on sale at 40-50% off! So after almost 2 hours of picking and analyzing, I got all the items I think our little boy will be able to use, and of course those that I could carry by myself. Baby boy definitely have taken his fair share of blessings! And yes, I'm excited much!